More than 200 investors, 750 startups, and 400 corporations showed up to the highly anticipated occasion. Also in attendance was the European Young Innovators Forum. The two-day conference was jam-packed with a stimulating agenda of keynotes, panels, and workshops. More than 100 speakers attended the event, including Louis Papaemmanuel and Matilde Masciulli with EYIF. Some unique activities included pitch competitions, live interviews, and reverse investor pitches. The purpose of the Summit was to bring together a diverse range of entrepreneurs, executives, and investors from all around the world to share ideas and discuss the dynamic changes of the tech-industry. At the Summit, Oana Bouraou is ought to meet corporates, media organisations and other startup enablers in order to further grow and strengthen the EYIF network regionally and internationally. 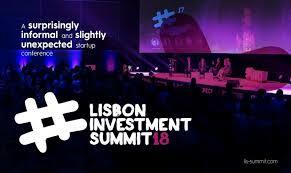 What is Lisbon Investment Summit? We’re Europe’s surprisingly informal and slightly unexpected startup conference. We bring together seasoned investors, daring entrepreneurs and innovative executives for a 2 day casual, sunny and action-packed event in Lisbon. Our favorite motto is #nobullshit. That pretty much sums up what you can expect from us. In 2017 we hosted 750 startups, 200 investors, 400 corporates and more than a 100 speakers from over 50 countries, for two sunny days in Lisbon.